Last night I went to see Eclipse, for my birthday. I waited 3 weeks to see it (well technically a lot longer than that -- but 3 weeks since it was released)!! This one is the best of the 3, so far. I had read a TON of reviews on the movie.. from both Twilight fans & just random movie-goers. It was rare that I read anything negative about this one. So I went in to it thinking good thoughts already. I felt like all the actors really became their characters in this movie. I thought to myself, FINALLY! They get it right! The chemistry between Edward & Bella was so there, right away in the opening scene. I found myself relating back to when I read Eclipse for the first time and how much I was sucked in to their romance & wanted to be a part of it. I never got that feeling while watching Twilight or New Moon. Robert Pattinson & Kristen Stewart just never seemed to connect as Bella and Edward, but in this movie they finally did! I was worried that the story line would be mostly about the newborn vampires & them coming to destroy Forks (Bella & the Cullens included). All the previews leading up to the movie release kept showing the action scenes between the vampires.. but my memory of Eclipse, the book, was mostly about Bella choosing between Edward & Jacob. Even though it wasn't really a choice, we always knew which one she was supposed to be with. I'm happy that the movie creators kept in line with that story, and made it just as much of the movie as the action sequences with the newborn vampires. 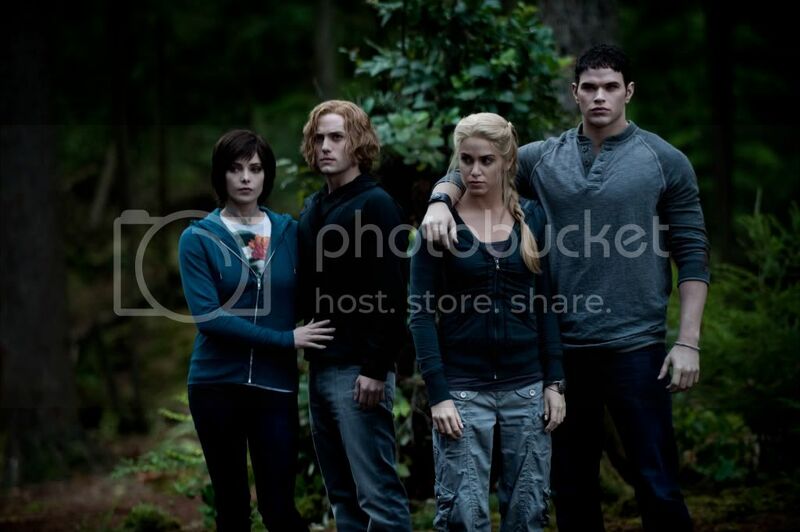 I hated the Cullens in Twilight and New Moon. I laughed at the actors ridiculous portrayal of each character. I never took their scenes seriously, and it seemed to ruin parts of those movies for me. 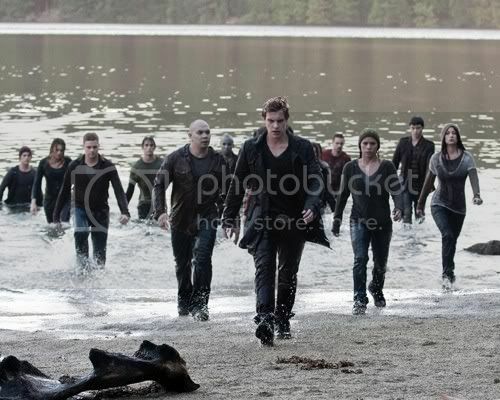 However, in Eclipse I felt like they finally grew in to their characters. Jasper (despite his awful hair!) and Rosalie did an awesome job telling their stories. For someone who had never read the books, I thought they did an excellent job explaining the details of what lead them to be a part of the Cullen family. There were quite a few one liners through out the movie that made me laugh! Charlie, Bella's dad, has been a favorite of mine since Twilight. His dry sense of humor, and his distaste for Edward is hilarious! The bluntness made me laugh. Charlie and Bella have never been able to share their feelings through words, it's usually been a silent understanding of one another. But there were a few scenes when Charlie tried to get his words across & in return just made Bella uncomfortable & embarrassed! Even though I am Team Edward, Jacob stole every scene he was in! I loved seeing the tension between him & Edward. It felt very real & he portrays the best Jacob for me! A lot of people love Jacob (or Taylor Lautner I should say) for his abs.. but I just can't get past the fact that he is just a kid underneath all that hottness! HA! Some of my favorite lines came from Jacob... at the graduation party when Jacob, the Cullens, and Bella were in the other room discussing the newborn vampires, and Jacob not having a clue what was happening he says, "Wait. What damn army?!" Just something about his directness & bitterness in his words made me giggle. Another scene (and one of my favorites!) when Bella, Edward, and Jacob are on the mountain, inside the tent, hiding from Victoria.. Bella is shivering to death so Jacob offers his body heat to keep her warm (obviously Edward is not a fan of this) and Jacob says to Edward, "Well I am hotter than you! "..Love it! If you're a Twilight fan, I'm sure you've seen the movie by now! If you aren't.. and have a slight interest, then I recommend it. I'm already wanting to see it again! Just because I feel like there were small details I missed. I'm glad they finally got it right. But I have a feeling they'll bomb with the next one, Breaking Dawn. I was not a fan of that book to begin with, so I am not so sure how they'll do with the movie. But as much attention as this franchise has gotten, I'm sure they could do anything with it and people will still pile in to the theaters to watch it! Excellent synopsis, Ginger. I totally enjoyed Eclipse -- it made me realize how bad Twilight was. Maybe it wasn't that bad, maybe it just took three movies before I accepted the characters as opposed to the ones in my head. Edward was HOT in Eclipse. One thing they did different was tone down the "vampire-ism" in the Cullens. Less obnoxious eyes, less super pale, etc. I mean, they had to kinda fit in with humans, right? Twilight WAS that bad! Ha! In my opinion, at least. New Moon was a step up, but didn't quite make it. I believe Eclipse brought it. Oh my goodness.. there were tons of scenes of RPattz that I kept thinking, "wow - he's gorgeous!". I never considered him to be my Edward, but I think he did a pretty convincing job in this one. FYI: I've been listening to the soundtrack all morning, remembering what scene each song was played. Definitely need to see the movie again to remember them all! NEAR as bad! Yay Summit and DS for getting it right!